Don Cheadle’s Mary J. Blige vs. Wanda Sykes’ George Michael on LIP SYNC BATTLE! 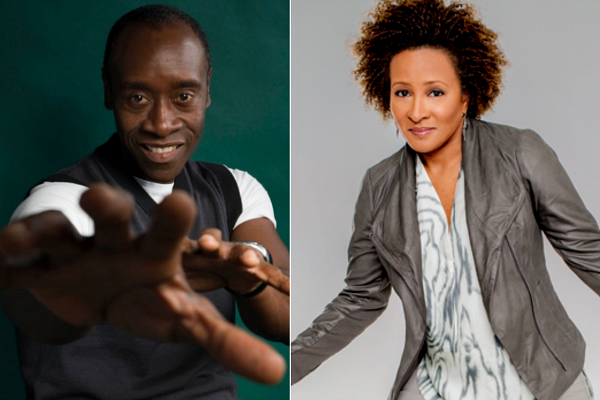 Possibly one of the best Lip Sync Battles EVER was actor Don Cheadle vs. comedian Wanda Sykes. They brought the house down which had Mary J. Blige in attendance! That’s right! This was a special episode because R&B legend Mary J. Blige was in the house to root Cheadle on. Blige watched from a distance up in the balcony. In fact, Cheadle’s opening number was indeed a Mary J. Blige song! After his lip-sync performance, Sykes poked fun at him by making reference that his performance wasn’t that great and she would also be nervous performing in front of Mary J. Blige. It was the last performances of the night that made or break each artist. Cheadle killed it on stage in a sliver, foil-like suit with a special musical guest Mase while singing one of his songs that he performed with The Notorious B.I.G.. After Cheadle’s performance, Sykes told him to go backstage and wrap-up the food with his suit! Lol! Then, Sykes entered the stage for her performance via high wire on a fake cloud equipped to sing George Michael’s “Faith” song. A little bit of back-story on each of these performances – Mase stated that the song which “Biggie” came out with was actually HIS song. And, why did Sykes sing “Faith”? She said she’s a big George Michael fan and in fact, his concert in London was the first concert she took her wife to. This episode, which filmed approximately five months ago, will be a nice tribute to the late singer, ’80’s pop icon George Michael who recently passed away of a heart attack on Christmas Day. The second show to this night of awesome battles was with actresses Lupita Nyong’o vs. Regina Hall. Lupita came out lip-singing to a Spanish version of an Enrique Iglesias song. She explained to hos Cool J. that she grew-up in Mexico and is fluent in Spanish. Hall rivaled her with a not as impressive performance. FULL Battle Details HERE! One battle I was really looking forward to was “Pitch Perfect”s Skylar Astin for obvious reasons. He went up against L.A. Lakers player Metta World Peace. 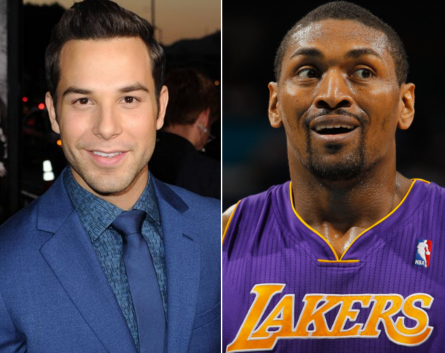 Metta went first with song “Insane in the Membrane”, and Skylar mouthed to a Justin Bieber song. Afterwards, Metta commented to Skylar that it wasn’t fair he chose a Bieber song because most of the audience was around 18-years-old. Side note: They really weren’t! Tune in to “Lip Sync Battle” this Thursday, January 12, 2017 on Spike to watch Wanda Sykes vs. Don Cheadle and see which celeb will take home the belt!